The Rautenberg New Leaders Project (NLP) is a premier program of The Jewish Federation that has trained emerging Jewish civic leaders in Los Angeles for more than 25 years. 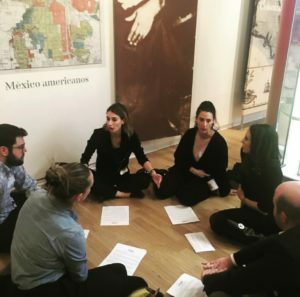 With a commitment to the Jewish tradition of social responsibility, NLP empowers participants to hone their leadership skills and gain a deep understanding of the diverse fabric of Los Angeles while working with elected, civic, and community leaders to address some of the most critical challenges facing our city. Aaron White is a current NLP participant. Read more about his experience! For Jews, the city of Los Angeles might feel familiar. The city has seen several rulers since its founding and, despite present appearance being nestled in a desert, is now lush and green and happens to sit by the sea. Aside from sharing similar geography with Israel, L.A. also shares a history of Jewish representation. When the pueblo of Los Angeles became the City of Los Angeles with the admission of California to the United States in 1850, Morris L. Goodman, a Jewish merchant, was on the first city council. In February, the Rautenberg New Leaders Program (NLP) visited Union Station and La Plaza de Culturas y Artes (La Plaza). The cohort met to learn about the origins of Los Angeles, discuss what effect the city’s past has on its present, and what can be done to change its future. 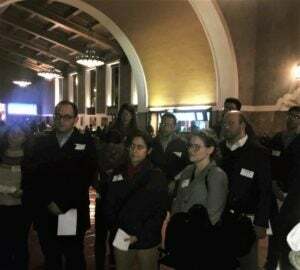 The evening started with Jeremy Oberstein, Chief of Staff for City Controller, introducing the NLP cohort to Union Station and reimagining it as the first port of entry for immigrants traveling by land at the turn of the century. This led our cohort to La Plaza for a walk through its historical exhibits, followed by a talk on Jewish Los Angeles with Caroline Luce, the Chief Digital Curator of the Mapping Jewish Los Angeles project. Jews in Los Angeles, as Ms. Luce explained, were a people in exile building a city of exiles. This history is complex, as Jews have been at the forefront of two opposing forces in Los Angeles. On the one hand, while many new to Los Angeles chose a lifestyle that tended to be exclusive, predominantly white or white-passing, and focused on development and security through following career paths in finance or real estate, counterparts in the Jewish community tended toward careers that allowed them to more radically pursue equity and affordability for the working class by becoming labor organizers, educators, and public officials. These forces were present at the building of the city when white people, Jews included, slowly bled the land away from Californios, people of Latino heritage native to California, after the state was admitted to the union. And later, these forces butted heads again at Chavez Ravine where Dodgers Stadium now stands. Even today, these two forces are in Hegel’s dialectical struggle against one another for the future of Los Angeles as the city continues to rapidly undergo change, which, some might decry as gentrification. One slogan at La Plaza used by Californios after California’s admission to the union can be used in many contexts, paralleling a feeling held by some around the issue of Israel today — “We didn’t cross the border, the border crossed us.” In a local context, the slogan takes on a meaning of a neighborhood undergoing change — gentrification. In the context of Israel and the settlements, this meaning is essentially the same. Both are regarded as measures of importance to the local Jewish community today, and the answers are kaleidoscopic, ever-changing images folding in on themselves as they are repeated. What we learned is that as young leaders, it’s important to reflect on the past. Just as important is finding ways to engage and shape the future of Los Angeles informed by our Jewish morality and by each other. This change is carried out by getting involved with Los Angeles Neighborhood Councils, attending public hearings by the Department of City Planning, and working with organizations and elected officials to take action on the issues important to us. These actions can determine future outcomes but cannot change what was most on the minds of our cohort: the current and past effects on tight-knit communities that were or are being displaced. From Boyle Heights, once known as the Brooklyn of Los Angeles, to the West Side and the Valley, the Jewish community has grown with the city of Los Angeles and continues to do so. No longer are we bound by red-lining — only by income. The spaces we build are not only physical like a new temple, but communal, and ask the question on all our minds — what is our shared vision for Los Angeles? I hope to find some answers this year with my Rautenberg New Leaders Project cohort. Aaron White grew up in the deserts of Southern California, largely between the Coachella Valley and Joshua Tree. He received a BA in Politics at UC Santa Cruz and an MA in Environmental Policy from Tel Aviv University. Aaron works as a non-profit professional and consultant. He specializes in database management and administration, grant writing, environmental policy, and market-driven urban policy. 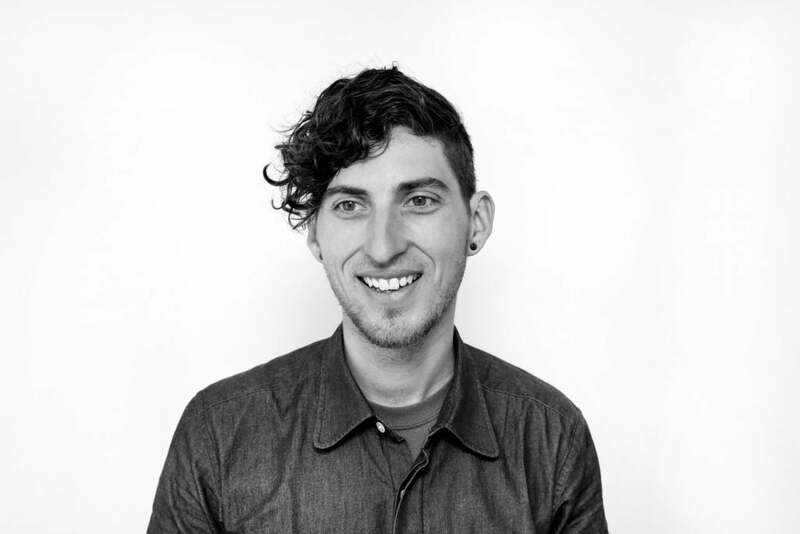 He comes to the New Leaders Project as someone who is constantly exploring and deepening his connection to Judaism as it relates to life, social justice, and professional development. Outside of the professional realm, Aaron runs many craft and DIY art workshops as well as small shows. He also enjoys silk screening, block printing, and making music. To learn more about NLP, visit www.YAJewishLA.org/NLP or email NLP@JewishLA.org.